Nancy Pak, Sept. 6, 2017, 9:39 a.m.
Four more THAAD rocket launchers will be installed this week at the U.S. missile defense base in South Korea, the Ministry of National Defense announced Wednesday despite strong opposition from local residents and activists. It said the U.S. 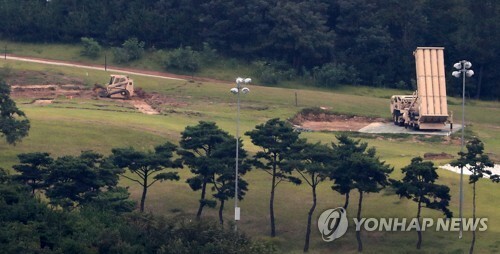 Forces Korea (USFK) will position the launchers at its new base in Seongju, some 300 kilometers south of Seoul, on Thursday, along with construction equipment and related materials. It did not reveal the exact time for the operation. The move comes after North Korea's recent string of ballistic missile and nuclear tests. The ministry stressed the urgency of mobilizing the assets, now stored at a USFK compound in the country, amid growing threats from the unpredictable neighbor. Two truck-mounted launchers and a powerful X-band radar are in operation at the former golf course. A THAAD battery is known to require at least six rocket launchers, also involving a fire control and communications unit. The ministry described the deployment as "provisional," citing the need for additional environmental impact assessment of the THAAD system, a process expected to take at least several months. The government recently wrapped up a months-long "small-scale" environmental impact survey. "There is no change in the government's position to make the final decision on whether the THAAD system will be deployed (in South Korea) after carrying out the general environmental impact assessment of the entire site thoroughly and fairly," the ministry said in a statement. 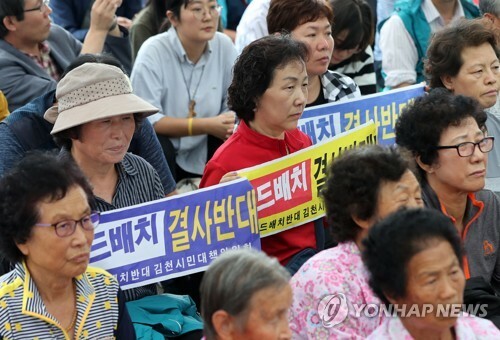 Local residents have protested against the THAAD deployment, taking issue with related domestic procedures. They also fear that their once-calm town will turn into a primary target of the North's attacks. Some are concerned that electromagnetic waves emanating from the cutting-edge radar could cause health and environmental problems. USFK officials were guarded about the estimated time of arrival. "We are relying on the Korea national police to clear the way" when it comes to the move, a USFK official said. Residents of Seongju, a county some 300 km south of Seoul, stage a protest against the installation of a U.S. missile defense system in front of a village office in the county on Sept. 6, 2017. Earlier in the day, a residents' group said it has confirmed the THAAD installation plan "through various channels," adding the installation is expected to begin at 2 a.m.
Thousands of police will likely be mobilized to prevent possible clashes. Soon after Pyongyang launched another long-range missile July 28, President Moon Jae-in ordered the temporary deployment of additional THAAD launchers. The deployment of the missile defense system, agreed by the allies more than a year ago, has been delayed amid controversy over a proper environmental survey. It's a tricky diplomatic issue as China and Russia have strenuously opposed the THAAD deployment, viewing it aimed at bolstering Washington's military presence in the region and undermining their security interests. Seoul and Washington have claimed it is only for self-defense against the North. In Beijing, Chinese Foreign Ministry spokesman Geng Shuang expressed grave concerns over the planned additional installation as he urged South Korea and the U.S. to withdraw the THAAD system.